ObeyTM 6 is a universal, compact controller ready to handle all the complexities of today's lighting fixtures. 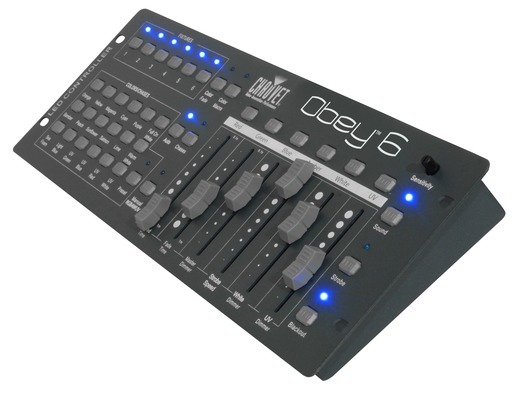 Capable of controlling up to 6 channels per fixture, the ObeyTM 6 allows you to control effects by simultaneously operating each fixture in different playback modes, with variable fade times. Increase flexibility with playback options that include manual RGBAWUV, automated and sound-activated model. Increase control with adjustable audio sensitivity, strobe, and blackout effects. Here we have the Chauvet Obey 6 in new and manufacturer refurbished which will come boxed 'as new' with a 1-year warranty. Buy this amazing Obey 6 with confidence with 100% satisfaction guaranteed or your money back! For 50 quid I am very impressed. Our LED Par cans now actually do more than flash independently (and randomly) it really does provide a much more professional stage lighting show for our band. Well worth the money!